Hagia Sophia was originally a patriarchal basilica in Costantinople. Built as a church in 360 AD, it was later expanded between 532 and 537 AD and was the largest cathedral in the world for almost 1000 years, until the completion of the Seville cathedral in 1520. Following the Ottoman conquest of Constantinople in 1453 Sultan Mehmed II ordered the building to be converted into a mosque. It was a mosque until 1935, when it was converted into a museum by the republic of Turkey. Its name derives from the Greek langauge and means Church of the Holy Wisdom of God. 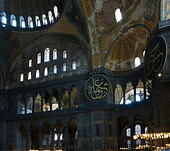 Hagia Sophia contains some impressive mosaics from the Byzantine peiod.